Researchers from Argonne National Labs and the Computation Institute are testing a new computational approach to accelerate development of new superconductor designs. Superconductivity is on the cusp of a new era. Defects in conducting medium can be tweaked to optimize current flows. 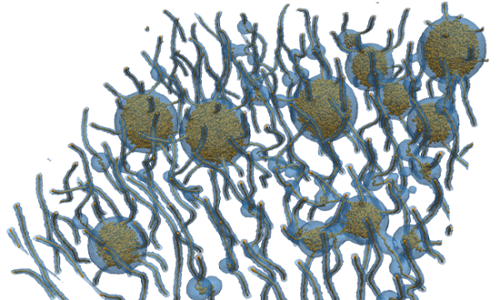 Supercomputer simulations allow for optimization — teaching scientists and saving time. MRIs and particle accelerators; magnetic levitation trains and cheap wind energy — all possible through the magic of superconducting. But first, scientists need to understand how to pass electric current without resistance. Researchers from the Computation Institute (CI) and Argonne National Laboratory (ANL) are using computer models to rise to the challenge. This joint team is studying a new computational approach to improve and accelerate the testing of new superconductor designs. Taking inspiration from the 'materials-by-design' framework at the core of the Materials Genome Initiative, they developed what they call 'critical-current-by-design' — simulation software to test different conformations of superconductors virtually before conducting experimental studies. In a new paper for Advanced Materials, Ivan Sadovskyy and colleagues applied this new approach to study how small defects alter the maximum current passed by a superconductor. In the presence of a magnetic field, superconductors create vortices that dissipate the current it carries. Counter-intuitively, defects in the superconductor material can actually offset this effect by 'pinning' vortices, preventing their motion and their current-limiting effects. However, there are many different types of defects, each possible in a variety of sizes, shapes, and patterns. For instance, a manufacturer may add self-assembling nanoparticles or a chemical treatment to form a pattern of oval shapes, or irradiate the material to produce columnar structures. The multitude of options creates more combinations than would be possible to study in the laboratory. Computational work performed as part of the Scientific Discovery through Advanced Computing (SciDAC) partnership led by ANL scientist Andreas Glatz, funded by the US Department of Energy (DOE). In collaboration with the Superconductivity and Magnetism group at the Materials Science Division at ANL, led by Wai Kwok, and the Center for Emergent Superconductivity, funded by the DOE. The new simulation code tackles the challenging mathematics of superconductor vortex motion and pinning in three dimensions. Representing the influence of various defects on the superconductor's critical current presents even more complexity, as their effect is non-additive — doubling the number of defects does not simply double the current passed, Sadovskyy says. But after a year of development, the team could successfully run simulations on supercomputers such as Titan at Oak Ridge National Laboratory, currently the second most-powerful supercomputer in the world. With the software, scientists can test different materials, defects, and designs without having to actually manufacture them. In the Advanced Materials paper, the researchers largely confirm the experimental results with the simulation as a proof of concept for critical-current-by-design. Going forward, they will reverse that flow, looking for the optimal arrangement, shape, and size of defects to inspire real-world experiments and design. One method they’ll use is an evolutionary approach, where random designs will compete for highest critical current until the 'fittest' combination of parameters wins out. Such work will hopefully shorten the road to more efficient, lighter, and less expensive superconductors, which would provide a boost to technologies ranging from the Large Hadron Collider to windmill farms. By boosting the power of commercial superconductors, the technologies of tomorrow may be even closer.